ARCI Recruitment 2016 Notification for 47 vaccancies on Data Entry Operator,Project Scientist, Project Coordinator Posts apply online at www.arci.res.in. 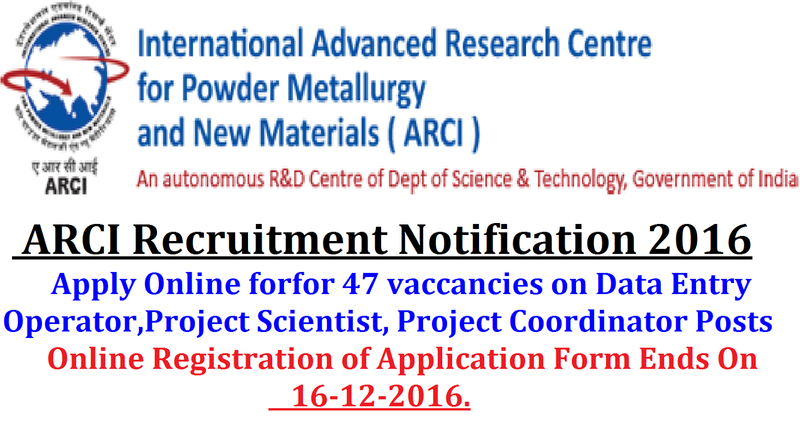 Job Info : ARCI (International Advanced Research Centre for Powder Metallurgy & New Materials) Has Released Recruitment Notification For 47 Data Entry Operator, Project Scientist, Project Coordinator Posts. All Eligible And Interested Candidates Can Apply Online On Or Before 16-12-2016 (16th December 2016). 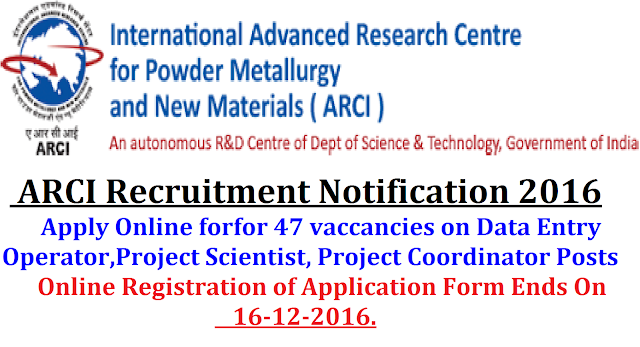 Further Detailed Information Regarding Educational Qualifications, Age Limit, Selection Procedure, Exam Pattern, Syllabus for ARCI (International Advanced Research Centre for Powder Metallurgy & New Materials) Recruitment 2016 – 47 Data Entry Operator, Project Scientist, Project Coordinator Post is mentioned below. Company Name : International Advanced Research Centre for Powder Metallurgy & New Materials. Company Profile : HRD play a vital role in recruitment process for ARCI. It looks at inducting the best talented candidates with strong zeal and motivation to pursue innovative research and to contribute to ARCI’s various projects/major programmes. Depending on the requirements, the following modes of recruitments are carried out by HRD. Direct Recruitment: Depending on the availability of the vacant posts, through open advertisements, candidates are recruited at various levels. Total No Of Posts : 47 posts. Qualification : Candidates should have done Graduation Degree (Technology) / Post Graduation Degree (Science / Maths / Statistics / Computers) / Master’s Degree (Physical Sciences) / Ph.D / Engineering Degree (Metallurgical / Materials / Mechanical / Chemical / Electrical & Electronics / Electronics & Communication) or its equivalent qualification from a recognized university. Salary : Rs. 50,000/- (Post 1), Rs. 30,000/- (Post 2), Rs. 15,000/- (Post 3), Rs. 1,21,000/- and Rs. 80,000/- (Post 4), Rs. 70,000/- (Post 5), Rs. 59,000/- (Post 6), Rs. 35,000 – 45,000/- (Post 7). Age Limit : Candidates upper age limit should not exceed 40 Years (Post 1,5), 30 Years (Post 2,3,7), 45 Years (Post 4), 28 Years (Post 6). Age relaxations will be applicable as per the rules. Selection Process : All Eligible Candidates will Be Selected Based on Their Performance In Written Exam, Trade, Skill Test, Interview. How to apply : All Eligible and Interested candidates may fill the online application through official website http://www.arci.res.in before or on 16th December 2016. Important Dates : Online Registration of Application Form Ends On : 16-12-2016.